Why Is the US Military Averaging More Than a Mission a Day in Africa? The officers running secret operations there have been calling Africa "the battlefield of tomorrow, today." The numbers tell the story: ten exercises, fifty-five operations, 481 security cooperation activities. For years, the US military has publicly insisted that its efforts in Africa are small scale. Its public affairs personnel and commanders have repeatedly claimed no more than a “light footprint” on that continent, including a remarkably modest presence when it comes to military personnel. They have, however, balked at specifying just what that light footprint actually consists of. During an interview, for instance, a US Africa Command (AFRICOM) spokesman once expressed worry that tabulating the command’s deployments would offer a “skewed image” of US efforts there. Last year, according AFRICOM commander General David Rodriguez, the US military carried out a total of 546 “activities” on the continent—a catch-all term for everything the military does in Africa. In other words, it averages about one and a half missions a day. This represents a 217 percent increase in operations, programs and exercises since the command was established in 2008. In testimony before the Senate Armed Services Committee earlier this month, Rodriguez noted that the ten exercises, fifty-five operations and 481 security cooperation activities made AFRICOM “an extremely active geographic command.” But exactly what the command is “active” in doing is often far from clear. AFRICOM releases information about only a fraction of its activities. It offers no breakdown on the nature of its operations. And it allows only a handful of cherry-picked reporters the chance to observe a few select missions. The command refuses even to offer a count of the countries in which it is “active,” preferring to keep most information about what it’s doing—and when and where—secret. While Rodriguez’s testimony offers but a glimpse of the scale of AFRICOM’s activities, a cache of previously undisclosed military briefing documents obtained by TomDispatch sheds additional light on the types of missions being carried out and their locations all across the continent. These briefings prepared for top commanders and civilian officials in 2013 demonstrate a substantial increase in deployments in recent years and reveal US military operations to be more extensive than previously reported. They also indicate that the pace of operations in Africa will remain robust in 2014, with US forces expected again to average far more than a mission each day on the continent. US troops carry out a wide range of operations in Africa, including airstrikes targeting suspected militants, night raids aimed at kidnapping terror suspects, airlifts of French and African troops onto the battlefields of proxy wars, and evacuation operations in destabilized countries. Above all, however, the US military conducts training missions, mentors allies, and funds, equips and advises its local surrogates. Saharan Express is a typical exercise that biennially pairs US forces with members of the navies and coast guards of around a dozen mostly African countries. Operations include Juniper Micron and Echo Casemate, missions focused on aiding French and African interventions in Mali and the Central African Republic. Other “security cooperation” activities include the State Partnership Program, which teams African military forces with US National Guard units and the State Department-funded Africa Contingency Operations Training and Assistance (ACOTA) program through which US military mentors and advisors provide equipment and instruction to African units. Many military-to-military activities and advisory missions are carried out by soldiers from the Army’s 2nd Brigade Combat Team, 1st Infantry Division, as part of a “regionally aligned forces” effort that farms out specially trained US troops to geographic combatant commands, like AFRICOM. Other training engagements are carried out by units from across the service branches, including Africa Partnership Station 13 whose US naval personnel and Marines teach skills such as patrolling procedures and hand-to-hand combat techniques. Meanwhile, members of the Air Force recently provided assistance to Nigerian troops in areas ranging from logistics to airlift support to public affairs. Previously undisclosed US Army Africa records reveal a 94 percent increase in all activities by Army personnel from 2011 to 2013, including a 174 percent surge in State Partnership missions (from thirty-four to ninety-three) and a 436 percent jump in Advise-and-Assist activities including ACOTA missions (from eleven to fifty-nine). Last year, according to a December 2013 document, these efforts involved everything from teaching Kenyan troops how to use Raven surveillance drones and helping Algerian forces field new mine-resistant ambush protected vehicles, or MRAPS, to training Chadian and Guinean infantrymen and aiding France’s ongoing interventions in West and Central Africa. AFRICOM spokesman Benjamin Benson refused to offer further details about these activities. “We do training with a lot of different countries in Africa,” he told me. When I asked if he had a number on those “different countries,” he replied, “No, I don’t.” He ignored repeated written requests for further information. But a cache of records detailing deployments by members of just the 2nd Brigade Combat Team, 1st Infantry Division, from June through December 2013, highlights the sheer size, scope and sweep of US training missions. June saw members of the 2nd Brigade Combat Team deployed to Niger, Uganda, Ghana, and on two separate missions to Malawi; in July, troops from the team traveled to Burundi, Mauritania, Niger, Uganda and South Africa; August deployments included the Democratic Republic of Congo, Kenya, South Africa, Niger, two missions in Malawi and three to Uganda; September saw activities in Chad, Togo, Cameroon, Ghana, São Tomé and Príncipe, Sierra Leone, Guinea, Uganda and Malawi; in October, members of the unit headed for Guinea and South Africa; November’s deployments consisted of Lesotho, Ethiopia, Tanzania, Uganda and Guinea; while December’s schedule consisted of activities in South Sudan, Cameroon and Uganda, according to the documents. All told, the 2nd Brigade Combat Team, 1st Infantry Division carried out 128 separate “activities” in twenty-eight African countries during all of 2013. The records obtained by TomDispatch also indicate that US Army Africa took part in almost 80 percent of all AFRICOM activities on the continent in 2013, averaging more than one mission per day. Preliminary projections for 2014 suggest a similar pace this year—418 activities were already planned out by mid-December 2013—including anticipated increases in the number of operations and train-and-equip missions. Full-scale exercises, each involving US Army troops and members of the militaries of multiple African countries, are also slated to rise from fourteen to twenty in 2014, according to the documents. So far, AFRICOM has released information on eleven named exercises scheduled for this year. These include African Lion in Morocco, Eastern Accord in Uganda, Western Accord in Senegal, Central Accord in Cameroon and Southern Accord in Malawi, all of which include a field training component and serve as a capstone event for the prior year’s military-to-military programs. AFRICOM will also conduct at least three maritime security exercises, including Cutlass Express off the coast of East Africa, Obangame Express in the Gulf of Guinea and Saharan Express in the waters off Senegal and the Cape Verde islands, as well as its annual Africa Endeavor exercise, which is designed to promote “information sharing” and facilitate standardized communications procedures within African militaries. Additionally, US and African Special Operations forces will carry out an exercise codenamed Silent Warrior 2014 in Germany and have already completed Flintlock 2014 (since 2005, an annual event). 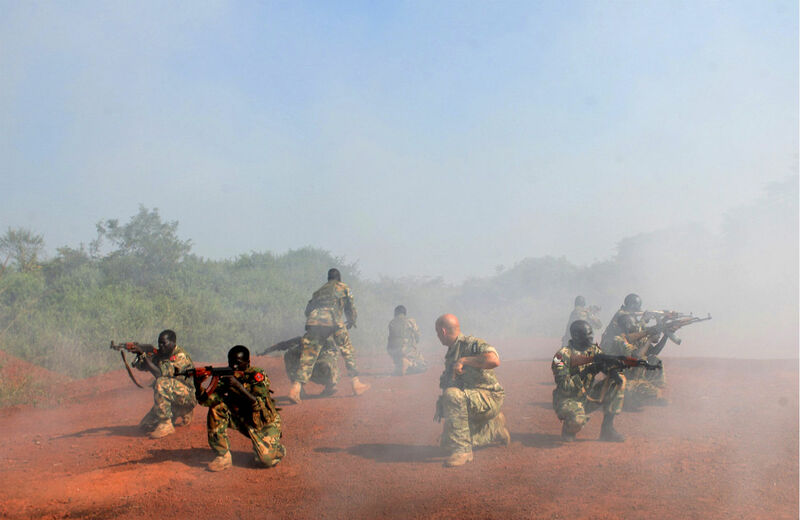 As part of Flintlock 2014, more than 1,000 troops from eighteen nations, including Burkina Faso, Canada, Chad, Denmark, France, Germany, Italy, Mauritania, the Netherlands, Nigeria, Norway, Senegal, the United Kingdom, the US, and the host nation of Niger, carried out counterterror training on the outskirts of Niamey, the capital, as well as at small bases in Tahoua, Agadez and Diffa. “Although Flintlock is considered an exercise, it is really an extension of ongoing training, engagement, and operations that help prepare our close Africa partners in the fight against extremism and the enemies that threaten peace, stability, and regional security,” said Colonel Kenneth Sipperly, the commander of the US Joint Special Operations Task Force-Trans Sahel, during the Flintlock opening ceremony. A 2013 investigation by TomDispatch analyzing official documents and open source information revealed that the US military was involved with at least forty-nine of the fifty-four nations on the African continent during 2012 and 2013 in activities that ranged from special ops raids to the training of proxy forces. A map produced late last year by US Army Africa bolsters the findings, indicating its troops had conducted or planned to conduct “activities” in all African “countries” during the 2013 fiscal year except for Western Sahara (a disputed territory in the Maghreb region of North Africa), Guinea Bissau, Eritrea, Sudan, Somalia, São Tomé and Príncipe, Madagascar and Zimbabwe. Egypt is considered outside of AFRICOM’s area of operations, but did see US military activity in 2013, as did Somalia, which now also hosts a small team of US advisors. Other documents indicate Army troops actually deployed to São Tomé and Príncipe, a country that regularly conducts activities with the US Navy. AFRICOM is adamant that the US military has only one base on the continent: Camp Lemonnier in Djibouti. Official documents examined by TomDispatch, however, make reference to bases by other names: forward operating sites, or FOSes (long-term locations); cooperative security locations, or CSLs (through which small numbers of US troops periodically rotate); and contingency locations, or CLs (which are used only during ongoing missions). AFRICOM has repeatedly denied requests by TomDispatch for further information on the numbers or locations of FOSes, CSLs and CLs, but official documents produced in 2012 make reference to seven cooperative security locations, including one in Entebbe, Uganda, a location from which US contractors have flown secret surveillance missions, according to an investigation by the Washington Post. Information released earlier this year by the military also makes references to at least nine “forward operating locations,” or FOLs in Africa. From 2008 to 2013, the number of missions, exercises, operations and other activities under AFRICOM’s purview has skyrocketed from 172 to 546, but little substantive information has been made public about what exactly most of these missions involved and just who US forces have trained. Since 2011, US Army Africa alone has taken part in close to 1,000 “activities” across the continent, but independent reporters have only been on hand for a tiny fraction of them, so there are limits to what we can know about them beyond military talking points and official news releases for a relative few of these missions. Only later did it become clear that the United States extensively mentored the military officer who overthrew Mali’s elected government in 2012, and that the US trained a Congolese commando battalion implicated by the United Nations in mass rapes and other atrocities during that same year, to cite two examples. After years in the dark, we now know just how “extremely active”—to use General David Rodriguez’s phrase—AFRICOM has been and how rapidly the tempo of its missions has increased. It remains to be seen just what else we don't know about US Africa Command’s exponentially expanding operations.